When we think of food, we tend to think of all the great things that come with it. The tastes, the aromas, the memories of special times celebrated. What we don’t think about is the natural capital that went into producing our food. Although we depend on food, and on nature to deliver it, the food system is the single biggest threat to our planet. It uses most of our land and water, is the biggest cause of biodiversity loss and deforestation, and causes around a quarter of all greenhouse gas emissions. This week, at the United Nations Environment Assembly (UNEA) in Nairobi, I was part of the launch of the sixth Global Environmental Outlook. It highlights the urgency to reduce the negative impacts of our food system on nature, so that human health can be aligned with the health of the planet. The report also notes that we already have the means needed for sustainable development but sufficient support is lacking. To transform the food system, we need to tackle production methods, policies and financial incentives but we also need to change how we consume and waste food at an individual level. For most of us, food provides multiple chances to make positive choices to improve the health of the planet. But we all think we are food experts and people can’t be expected to automatically make the right choices if they are not aware of how the food system impacts nature. To understand the current level of public awareness of the threat the food system poses to nature, WWF conducted a global survey of over 11,000 people of varying ages, incomes and social circumstances. The survey was conducted in Australia, Brazil, Colombia, India, Indonesia, The Netherlands, Malaysia, South Africa, United Kingdom and USA. The results were striking. On the whole, awareness of the problem is incredibly low. 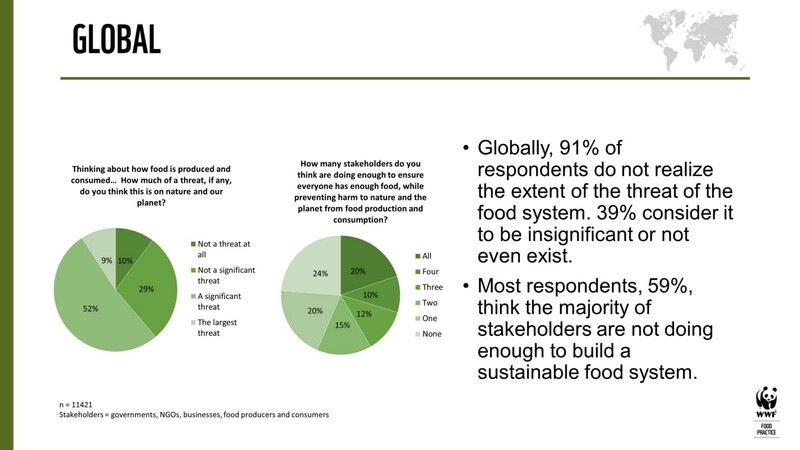 Just nine per cent of the respondents realize the food system is the largest threat to nature. Though many do realize there is some threat, they don’t understand the true extent. In four of the world’s five most populated countries, Brazil, India, Indonesia and the US, more than one in ten people think food causes no damage to nature. In the US and Indonesia more than half see the threat as less than significant. It is also evident that although we place much hope for a sustainable future on today’s youth, they are not ready for the vanguard. In the youngest age group (18–24 years old) of respondents, 11 per cent think there is absolutely no threat posed to nature — the proportion rises to 40 per cent when the threat is seen as insignificant or not existing. In Brazil, Colombia, India and the Netherlands, this age group were the most likely to say that no threat existed. 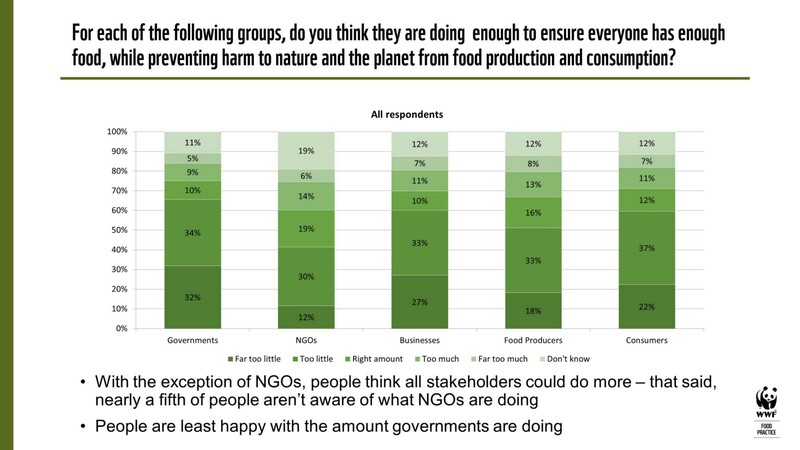 Although the general public don’t explicitly realize the true extent of the threat, they seem to have an intuitive connection with the problem once they are asked whether or not they want to see stakeholders doing more to create a sustainable food system. More action is demanded — 59 per cent feel that the majority of stakeholders are not doing enough. Governments, in particular, are seen to be doing too little. In three countries, more than three quarters say governments do not do enough — Brazil (80 per cent), Colombia (81 per cent) and South Africa (82 per cent). Businesses are also widely seen as being able to do more (60 per cent say they are not doing enough), but consumers do realize their own role in in the lack of progress towards sustainability, holding themselves equally accountable (59 per cent think consumers do not do enough). This indicates that more awareness of the problem could help create a strong consumer voice that could significantly shift behavior, influence governments to innovate policy, and prompt companies to establish a new set of business ethics that align human and planetary health. Alongside mass awareness and education programmes, we can create real impact by equating healthy eating with sustainable eating. The public must understand that what we eat effects our planet as well as our bodies. 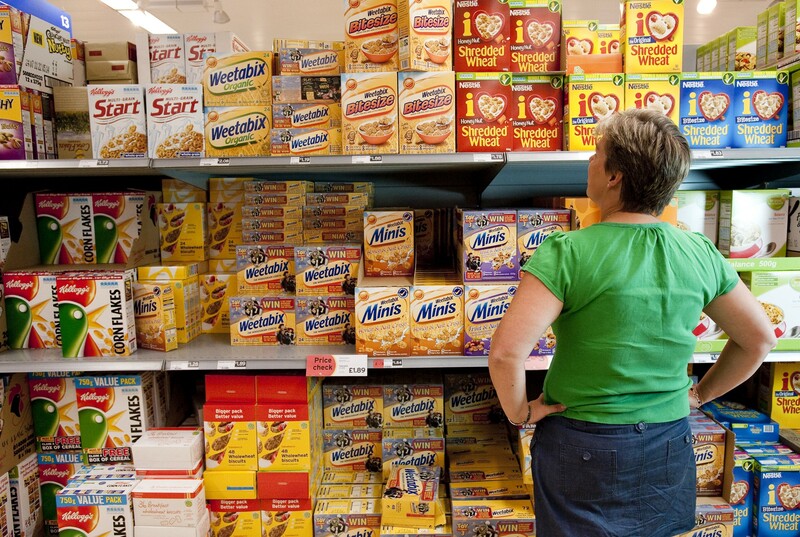 Evolving National Dietary Guidelines to promote foods which are both environmentally and nutritionally favourable would go some way to mainstreaming ideas of better produced foods as part of a balanced and varied diet. To enable consumers to adopt balanced and better diets, there must be easy to access information at the point of purchase. The public need to know what has been produced sustainably — labels and certifications are an important sustainability tool, but the private and public sectors have a responsibility to make sure standards are continuously strengthened and to drive accountability across the supply chain. To make consumer choices easier, corporates must implement sustainable sourcing across their supply chains — with deforestation and conversion-free foods at the heart of efforts. With an area the size of South America degraded and underperforming, and 1/3 of all food wasted, we don’t really need to convert more land to produce food. Regarding food waste, we need to remove it as an option for consumers. After all, when food is wasted, we are also wasting natural resources and the labor that was put into its production. Business practices which lead to consumer waste, like over-serving and poor labelling, can be tackled, while hotels, restaurants and supermarkets must implement measurement and management processes to reduce the amount of food they are throwing away. Government programmes and incentives may be required to accelerate change. We can make the food system work for people and nature. By working together, we all have the power to bring food to the top of the conservation agenda and help protect our global food security. To do that, we, consumers, need to deal with food in a different way and seal a new contract with the planet. We need a New Deal for Nature and People.